Thousands of years ago, people constructed shelters and huts by hand with extremely simple tools. As society developed and cities began to emerge, professionals like carpenters and bricklayers appeared to construct more complex buildings. 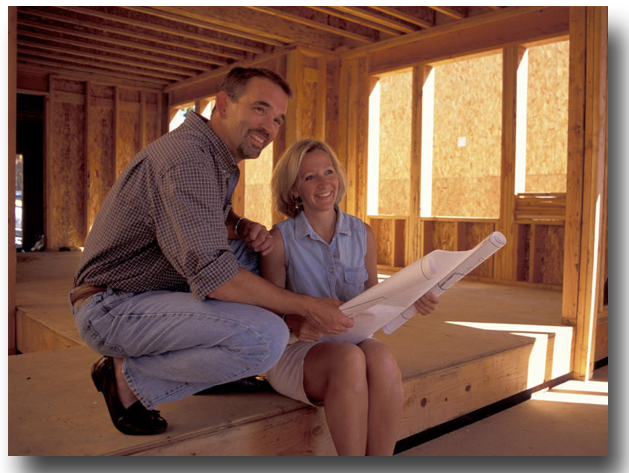 Eventually, home improvement construction techniques evolved to develop a wide variety of housing structures available in neighborhoods like yours today. Modern homes have more systems of construction involved than the average homeowner can really see from the outside. While some homeowners have enough expertise to make minor repairs such as replacing appliances, most people hire professionals to do more complicated work. However, it can be tough to hire the right contractor if you don’t really understand the work they’re doing. Home improvement construction can generally be broken down into four stages: the design and budgeting phase, exterior construction, interior construction, and finishing touches. Let’s take a closer look at each one. 1. The design and budgeting phase consists of creating an architectural design, coming up with concepts for the floor layout, and ensuring the project meets all required building codes. The architectural design and floor layout establish the character and tone for the home, while the building code lays out regulations for the safety procedures that must be followed during construction. During this phase, your contractor will provide you with an estimate for the project. Be sure to get a detailed estimate so you know exactly what you will get for your money. 2. Exterior construction consists of building the foundation and constructing a frame for the house. This building procedure is based around building a strong foundation, constructing a stable frame for the structure and attaching exterior wall coverings and a roof. Once the structure is enclosed, siding, exterior stone, sidewalks, driveway, decks, and landscaping can be completed at the proper time. 3. Interior construction is when your contractor will work with trusted and reliable subcontractors on the ventilation, air conditioning, insulation, plumbing, electrical wiring, cabinetry, painting, flooring, and so forth. During this stage, it is wise to have all interior carpentry, especially trim work, done by skilled master carpenters. 4. After the exterior and interior construction phases of the home are completed, your contractor will work on the finishing touches. This stage of the project includes completing the final construction punch list items and final inspections. This phase is much smaller than the others, but it is no less important. Most home construction projects are simple, minor renovations such as room additions or bathroom remodels—and in some cases, homeowners can complete these jobs themselves. However, DIY projects very often result in unanticipated expenses and low-quality work if they aren’t planned carefully. Thorough planning is essential to successful projects, as contractors must consider scheduling, budgeting, site safety, availability of materials, permits and licensing requirements before beginning a construction project. Fortunately, an experienced contractor carefully supervises and manages each stage of your home construction project in order to make sure that all work is performed according to high standards and that all costs fit within your budget. Craig at Schoenberg Construction is one of the best home improvement contractors in St. Cloud. Craig always gives honest, fair bids with no lowball, fake pricing, plus there’s no sales pressure, ever. He never uses cheap materials and never engages in sloppy workmanship, and his company is known as one of the top home renovation companies in the Saint Cloud, Minnesota area because he insists on doing every job exactly right.